Bus and Limo Bus Photo Gallery provided by Classic Wedding Cars, Chicago, Limousine buses, minibus, coachbus rentals. from 24 to 50 passengers and have forward facing airplane style seating. for your bridal party or guests and is budget-friendly. Stereo CD-player, DVD, and a 42' Plasma Flat screen TV. 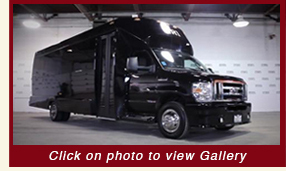 Our limo buses range in size from 22 passenger to 45 passenger.